To die or to live dying? Euthanasia: A matter of life and death Dateline's special, Allow Me To Die, examines the world's most liberal euthanasia laws in Belgium. Euthanasia, from the Greek word meaning “good death”, is the practice of assisted suicide with the intention of relieving pain and suffering. Euthanasia is also known as mercy killing or physician assisted suicide. Like all things that deal with life and death, it has been a controversial subject of debate due to its seeming infringement of a person’s fundamental right to live. As a law, voluntary euthanasia is accepted in some countries, including some states in the United States and provinces in Canada. Euthanasia is also one of the most actively researched and debated subjects in modern bioethics. Surveys taken in the United States indicate that an estimated 46% of physicians agree that voluntary euthanasia should be allowed for certain situations, with 41% disagreeing altogether and 14% believe it to be circumstantial. From a twenty first century, the individual will have to personally agree with the ethical argument that states that everyone should be able to choose when and how they want to die, and that they should be able to do so with dignity. Moreover, as the link itself says it can be argued that it does have to do with the quality of life as well. What is life? The main reason for humanities existence is fundamentally to reproduce. It might be cruel but after a while humanity cannot do that. Thus one cannot see any reason as to why a painless death, chosen, by the individual is even fundamental to argue. The argument that : "A physician shall always bear in mind the obligation to respect human life". is filled with flaw in its totality. Doctors, by nature tend to be more care towards people, and subsequently would not kill at will but would opt to kill if it was necessary. 1. Can quickly and humanely end a patient’s suffering, allowing them to die with dignity. 2.Can help to shorten the grief and suffering of the patient’s loved ones. 3.Everyone has the right to decide how they should die. 4.Death is a private matter, and if you are not hurting anyone else, the state should not interfere. 5.Most people would have their pets put down if they were suffering – this would be regarded as kindness. Why can’t the same kindness be given to humans? 6.Illness can take away autonomy (the ability to make choices) and dignity, leaving you with no quality of life; euthanasia allows you to take back control in deciding to die. Self-determination is one of the key elements that make us human. It is the ability to determine our destiny as individuals and is facilitated by our ability to think for ourselves. Imagine a life where an illness has left you incapable of conducting the basics of life; you are unable to breathe, move or even think for yourself. You have effectively removed your ability to self-determine, arguably a significant element in being “human”. Our sense of “self” is created as we progress through life. We grow our personalities as human beings by our choices and experiences. This sense of self is the foundation of our human dignity. Now, go back to the example of the person who can no longer breathe, move or even think for himself, and add the element of extreme and constant pain to the point where they prefer death to living this way. Over time, because of this experience, the person will eventually lose sight of their “self”, when they could move around, form opinions and self determine. This will all be a distant memory, and the most real thing to them will be the constant state of pain they are in. They won’t even be able to cry out in pain despite the pain. Seem far-fetched? Consider Tony Nicklinson, whose bid for euthanasia was rejected multiple times. Tony Nicklinson was diagnosed with a disease that prevented him from moving any and all muscles in his body. At the end of the line it all comes down to a number of small factors, do we have the right to compare experiences day by day, having experienced none of them, and say that they don’t deserve to die with dignity, the way they want to die? The answer is of course, no, we have no right to deny people the dignified death that we ourselves naturally desire. To do so would be selfish and we would effectively be imposing our own desires on that person, thereby restricting their freedom to self-determine even if it is in the most basic sense. The Legal argument states, which proclaims some fundamental human rights:, and in reference to Article 2 in specific the first substantive right proclaimed by the ECHR is the right to life, set out in Article 2 and reproduce. The right to life is listed first because it is the most basic human right of all: if one could be arbitrarily deprived of one’s right to life, all other rights would become illusory. The fundamental nature of the right is also clear from the fact that it is “non-derogable”: it may not be denied even in “time of war or other public emergency threatening the life of the nation” – although, as discussed later, “deaths resulting from lawful acts of war” do not constitute violations of the right to life (Article 15 (2). Article 2 protects “everyone’s” right to “life”. “Life” here means human life: neither the right to life of animals, nor the right to existence of “legal persons” is covered by the concept. Animals are not “persons” and hence not included in the concept of “everyone” and are therefore not protected by the Convention at all. The main argument, in principle of the abovementioned Article, in principle is simple the right to life, upholds that one can easily have the right to decide when and if they would like to die. This was also upheld by most judgements on de facto case law. The applicant was dying of motor neurone disease, a degenerative disease affecting the muscles for which there is no cure. Given that the final stages of the disease are distressing and undignified, she wished to be able to control how and when she died. Because of her disease, the applicant could not commit suicide alone and wanted her husband to help her. But, although it was not a crime in English law to commit suicide, assisting a suicide was. As the authorities refused her request, the applicant complained that her husband had not been guaranteed freedom from prosecution if he helped her die. The Court held that there had been no violation of Article 2 (right to life) of the Convention, finding that the right to life could not, without a distortion of language, be interpreted as conferring the diametrically opposite right, namely a right to die. The Court also held that there had been no violation of Article 3 (prohibition of inhuman or degrading treatment) of the Convention. Even if it could not but be sympathetic to the applicant’s apprehension that without the possibility of ending her life she faced the prospect of a distressing death, nonetheless, the positive obligation on the part of the State which had been invoked would require that the State sanction actions intended to terminate life, an obligation that could not be derived from Article 3. 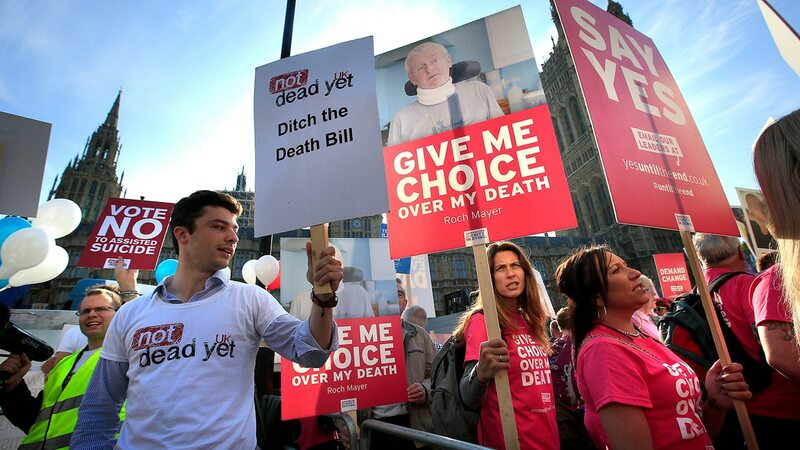 All in all, Euthanasia, at the end of the line should be a choice, an individual choice. If people would like to end their lives to prolong the inevitable they should be able to do so. Physician assisted euthanasia, legally gives a competent person the right to end his or her life with the help and guidance of a medical practitioner by way of prescribing lethal doses of drugs. The time or date of the commission of the act, however, is the sole discretion of the patient. It is not to be mistaken for euthanasia or what is commonly known as mercy killing wherein a physician will be the one to administer lethal medication. Economic crisis, growing migratory pressures, social and economic inequalities, xenophobia, regional conflicts, extremism and populism are today’s main challenges Europe has to face. Assessing the Battlefield: Why are There Calls for 'Brexit'? What is driving the anti-EU and no campaign in the Brexit referendum? Nathan Wheeler Following extensive work with Amnesty International researching death penalty cases in the United States and forced evictions in Italy Nathan’s work shifted to human rights and its interaction with religious rights. He studies Law in Dublin City University and has an avid interest in the foundati..